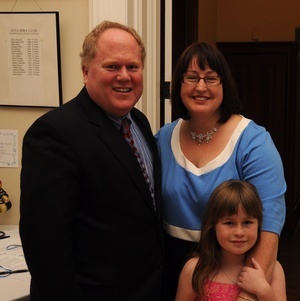 The other night I attended a very nice, intimate reception celebrating new San Leandro Mayor Stephen Cassidy, pictured below with his wife Amy and daughter Fiona. As you may know, San Leandro is just a 15 square miles city located between Hayward, Oakland, and the San Francisco Bay, population of about 80,000, but it is well regarded for its peaceful neighborhoods, and a well funded emergency services plan. Mayor Cassidy won against former, long time San Leandro Mayor Tony Santos, who many confused as being Latino but who is actually of Portuguese descent. Apparently, Mayor Cassidy’s victory is attributed to being social both in the Social Media world 😉 and in the traditional sense, knocking doors and organizing house parties. All efforts lead by campaign manager Tim Holmes and wife Mitch, owners of Zocalo Cafe. A third element, according to some, could have been Ranked Choice Voting. It has been said that RCV gives opportunities for less known candidates. Interesting enough, I just found by chance an open letter in the Hawaii Reporter by former Mayor Santos, saying “Don’t Adopt Instant Runoff Voting or Ranked Choice Voting,” click here to read it. RCV may not be the latest thing to talk about here right now, but judging from the Hawaii Reporter, it is an issue in places considering this option. One way or another, Mayor Cassidy, an attorney, says he is ready to work for San Leandro. What do you think? Make a comment below is you wish :-)! I’m Tim Holmes mentioned in the article, the link above is to a different Tim Holmes, the sculptor. You can link to Zocalo Coffeehouse at . And the City of San Leandro at .